In the suburbs of Houston, something extraordinary is happening, born out of a desire to create a family-oriented, self-sufficient community. Harvest Green is a 1300 acre, master-planned and expertly designed agrihood, ready to blossom. Located in Fort Bend County, in the suburb of Richmond, Texas, this farm and garden community offers all the benefits of a country lifestyle without the inherent downsides to an isolated homestead. So what is an Agrihood, exactly? These central farm-based home developments have been gaining popularity over the last several years with families that want a lifestyle that is safe, active and results in the provision of farm-to-table meals and fresh, locally produced food. Harvest Green promises a modern lifestyle, but one that slows down and allows families to place a focus on contributive skills, such as farming and cooking. The residential plots are close enough together to make Harvest Green a typical, close-knit suburban neighborhood, but one that benefits from an agricultural community lifestyle. Part of what makes Harvest Green so unique is the meticulous planning that goes into its design. Harvest Green’s designers put a premium on the preservation of open space, in a time when even suburban areas are becoming more dense, crowded and hectic for the families that live in them. In this Texas agrihood, 280 acres of undisturbed greenbelts and open spaces stretch across the environment to give the suburban community the feel of a wide open expanse of rural land. When you look at a map of Harvest Green, the expert planning of various locations is one of the first things you notice. The southeast portion of the community is filled with residential lots separated by lot size, and the neighborhoods for the shape of a semi-circle around the community center, retaining the small town feel that prevails in a place like Harvest Green. Farther out, you’ll find the site of a farmers market and the central farms that Harvest Green touts as the center of production for the whole community. For most people, there won’t be any familiarity to the way a farm community operates, so it may seem like a scary first step to take up residence in a place like Harvest Green. Part of what makes this particular agrihood so fulfilling for its residents, however, is the opportunity for structured family development that a simple farm doesn’t offer. For example, Harvest Green currently has Travis High School and James Bowie Middle School within the community, and plans for an elementary to open in the fall of 2017. It offers all the benefits of Fort Bend County Schools with the addition of education based on the principles of the community. Plots in the community farm are set aside for educational programs for students of all ages, so that school curriculum is preparing children for the lifestyle that their families live it at home over their entire educational career. That doesn’t mean that the schools don’t excel academically, however. Travis High School has been recognized for the faculty’s ability to prepare students for college, and the school system offers courses of varying difficulties, a broad range of excellent athletic teams and clubs and various other ways to get involved a typical high school atmosphere within an atypical community. 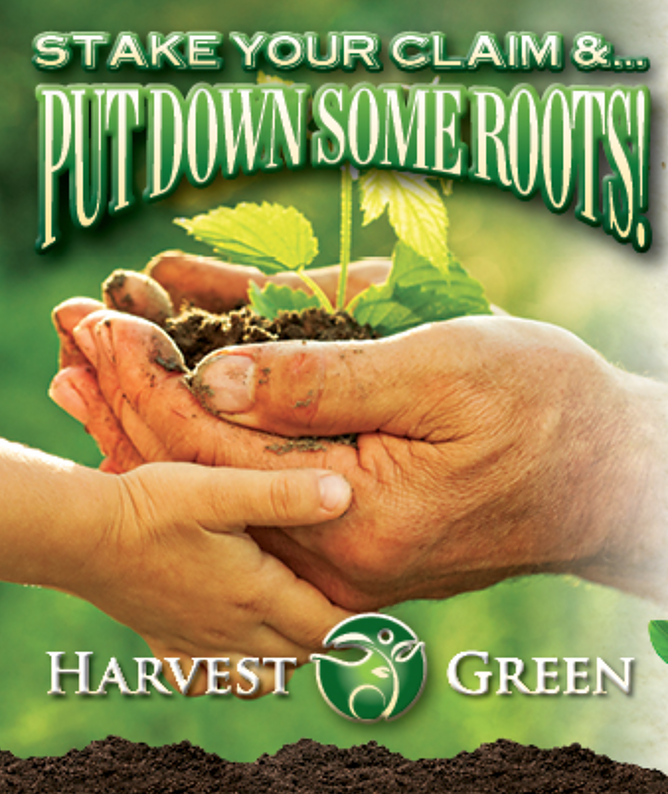 Harvest Green allows education to transfer into families’ home life. Properties in the community are planned with space for home gardens for small-scale agriculture on top of the community’s larger production. Harvest Green truly takes the role of a farm community seriously. A 300-acre farm sits adjacent to the residential part of the community, tended by agricultural experts using top-of-the-line equipment. The farm supplies fresh produce to residents of Harvest Green through the community’s innovate farm-share connection. Additionally, Harvest Green residents that are interested in farming can lease land from the central farm and use the equipment to tend their lots. Whether a resident simply puts their time into caring for a backyard garden or into an investment in farming, it’s easy to see that Harvest Green cherishes the agricultural thread that ties the community together. This tie is extended even further with Harvest Green’s collaboration with Edible Earth, a team of expert farmers seeking to integrate agriculture into everyday life. Edible Earth will be in charge of the farm at Harvest Green, as well as responsible for small-scale agricultural integration efforts within the community’s neighborhoods. Some people, upon hearing the phrase ‘farm community’ may not conjur thoughts of modernity, but Harvest Green is truly innovative in this sense. In the community’s central area, there will be an enormous swimming pool with a patio, a beautiful and elegant lake view amphitheater, a park, playground and splash pad for children, a lawn for events and relaxation and a community center for all other purposes. The community center is especially useful, due to Harvest Green’s installation of a community events director who will oversee collaborative community activities contributing to the closeness and togetherness of this unique community. These include festivals, classes on cooking and farming, activities to enrich the mind and body, holiday celebrations, social groups, workshops and more. The Harvest Green agrihood is focused on the idea that a communal lifestyle is no better than the sum of those that live there, and take this idea to heart with the latest in enrichment courses for personal and agricultural development. Of course, in the modern world, no community can truly be isolated from its surroundings with communication so instant and wide-spanning. Luckily, Harvest Green is nestled in a part of Texas that is ideal for its existence. Fort Bend County is one of the fastest growing and healthiest counties in the United States, leading it gain acclaim from Congressional Quarterly as one of the safest U.S. counties in which to raise a family. Harvest Green is close to other greater Houston suburbs Sugarland, and Katy, cities touted for excellent job markets and safety. Fort Bend is a great place to settle, and Harvest Green takes it a step further with access to a unique, agrihood community unlike anything found in the region. Harvest Green partners with a variety of construction companies and offers varied lot sizes so that houses within Harvest Green won’t have the cookie-cutter appearances of some master-planned communities. Lots are available in 5 sizes, and with homes from 12 different builders in a wide range of prices, prospective Harvest Green residents can find the homes of their dreams within this charming community.